In 2016, the copyright for Hitler's 1925 autobiography Mein Kampf expired, giving publishers free access to the text and raising concerns that the title would experience a surge in interest. 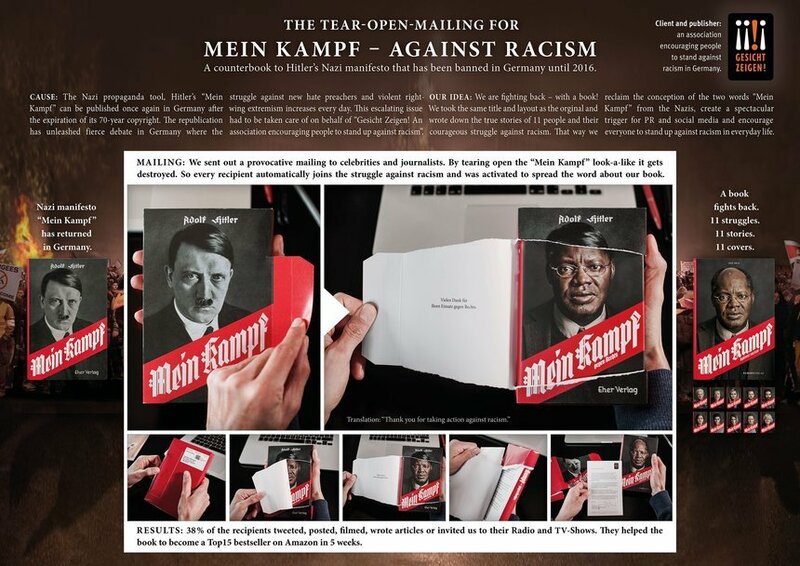 So Ogilvy Germany planned the ultimate response – publishing a 'counter-book' that told the stories of eleven individuals and their struggle against racism. The agency put together a group of eleven people, each with stories to tell about their own experience of racism – a man that stood up to nazis, a woman that removes nazi graffiti and a pro-refugee German mayor, amongst others. Part of the PR strategy was to feature people from across Germany, with the hope that regional press would have some extra incentive to share the story. The book's cover follows the same visual language as previous editions, using blackletter and a red stripe across portrait photography. A limited number of special edition books were also sent out, with an extra Hitler dust jacket that needed to be torn off to reveal the real cover underneath. Getting this reinvented version of Mein Kampf into book stores wasn't easy. The agency needed a publishing partner to establish credibility and help oversee the process, but many publishers were unsure about how many readers would be happy to be seen reading the book, or displaying it on their shelves.